The screened-in porch in this “Texas in California” home is homeowner Sandy’s favorite room. It is open to breezes from the canyon. 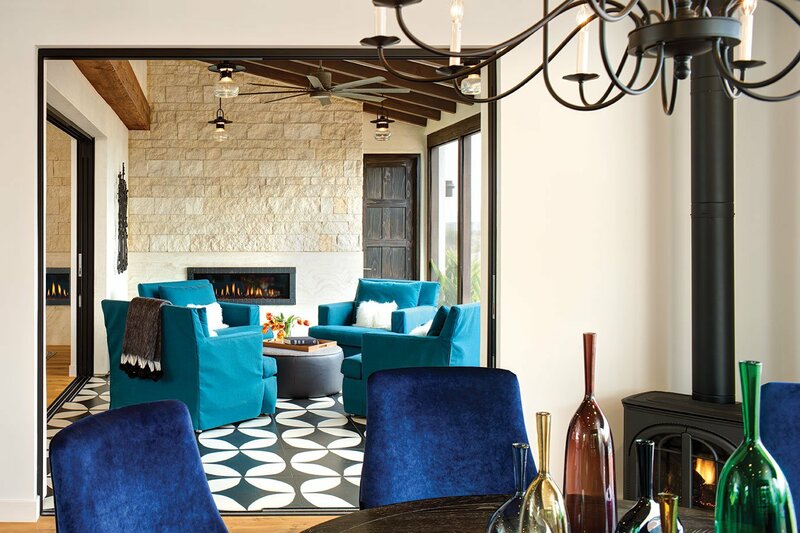 Realizing their 6,800-square-foot residence was just too large as their children left home and they transitioned into “empty nesters,” Sandy and Alton White decided to downsize and build a smaller house reminiscent of their Texas Hill Country roots. Comfortable in their Del Mar Mesa community, down the street from their long-time residence they found a 1-acre lot on a quiet cul-de-sac offering sweeping protected views over the Los Peñasquitos Canyon Preserve. 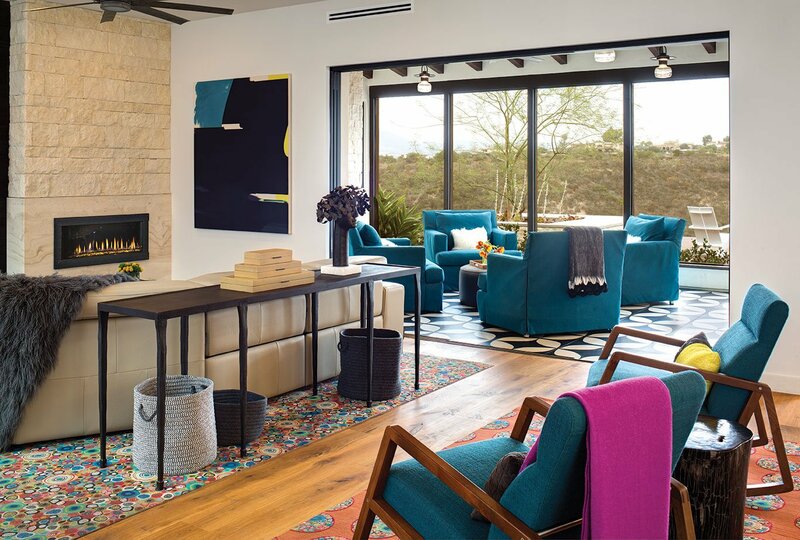 Despite its limited buildable space, the land proved suited to their vision of a simpler, relaxed lifestyle in an easy-care modern interpretation of a Texas farmhouse filled with brilliant colors and surrounded by succulents. The great room opens onto the screened-in porch to an expansive canyon view. “We always have pretty definitive ideas about what we want,” Sandy explains, with Alton focusing more on their home’s structural elements while she had fun with the interior. 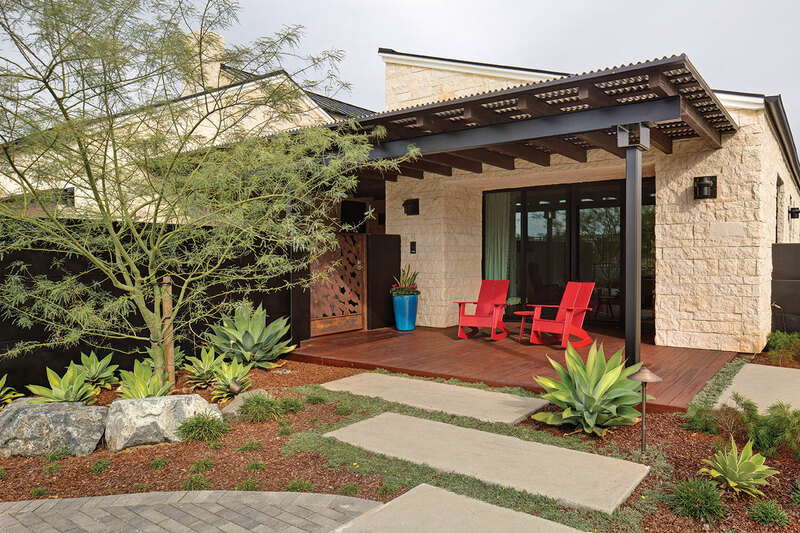 Native Texans living in San Diego 25 years, the Whites constructed their new home using strong but simple horizontal and vertical lines and typical Texas design elements, including a pitched, standing-seam metal roof; welcoming porches; shaded patios; and an interior courtyard providing indoor-outdoor living spaces. With white limestone walls; a pitched, standing-seam black metal roof; a tin-roofed porch; and an expansive deck, the rear facade of Sandy and Alton White’s Del Mar Mesa home demonstrates the design’s Texas-inspired roots. Gabion wire cages contain rocks excavated from the property. “In small-town Texas, everyone gathers in someone’s home to relax and visit. At my grandparents’ house it was always on the front porch in rockers and porch swings. At a brother’s house it was in the backyard under a porch made from iron beams and corrugated tin,” she says. 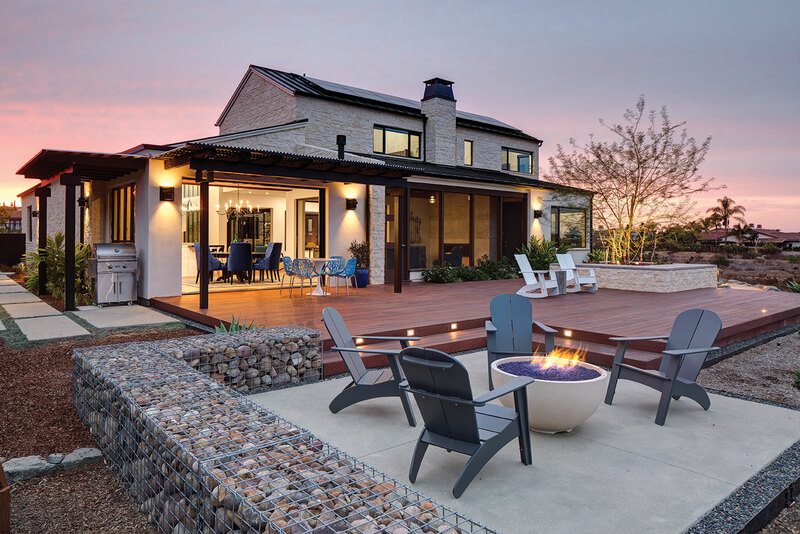 They wanted their new home to be eco-friendly and low-maintenance with solar panels and drought-tolerant landscaping yielding low electric and water use. Sandy specified no grass, pool or hot tub. 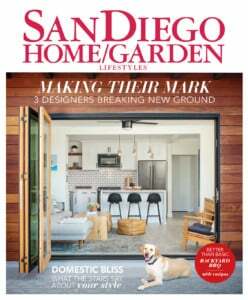 To fulfill their vision they turned to Del Mar’s Brian Sipe, a creative former NFL football player-turned-home designer who drew the plans for their previous, expansive Mediterranean-style home, where they lived for 10 years. He hand-sketched designs for their new 4,250-square-foot home, which provides about 3,000 square feet of downstairs living space for Sandy and Alton and another 1,250 square feet upstairs with bedrooms and a lounge area for their two children, daughter Madison, 22, and son Mitchell, 24. 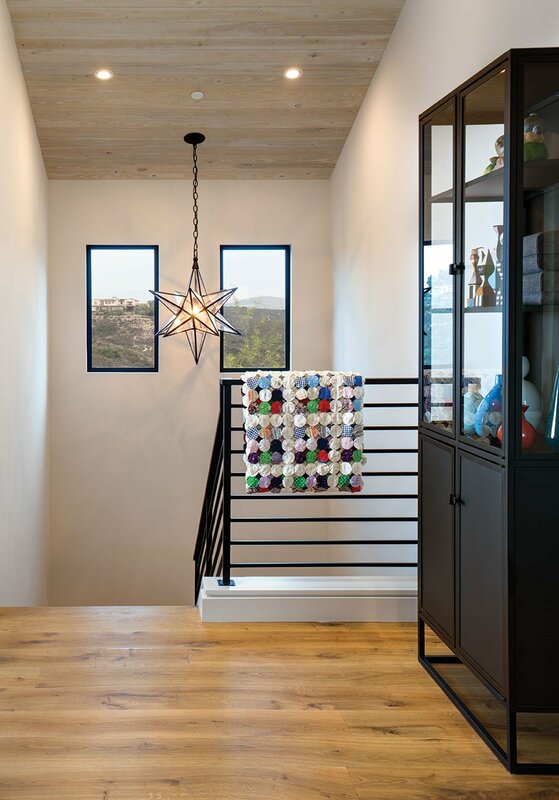 They entrusted the interior design to San Antonio native Anita Dawson of Point Loma-based Dawson Design Group, who, along with lead designer Mark Stocker, sprinkled reminders of the Whites’ Texas homeland within their living spaces. Sandy’s instructions were simple. Black charred shou sugi ban wood paneling disguises a flat panel TV and screens off the master bedroom. To the left is a leaded-glass door designed by Anita Dawson to showcase the Texas star. Siting the house proved complicated because of the parcel’s building restrictions. The lot’s zoning also limited the home’s width to 64 feet, forcing them to think carefully about space allocation, Sandy says. The entire project, from design through completion, took about 22 months. That “first view” of the Whites’ home suggests its Texas inspirations, with a pair of welcoming red Adirondack chairs on its front porch, shaded by a corrugated tin roof. 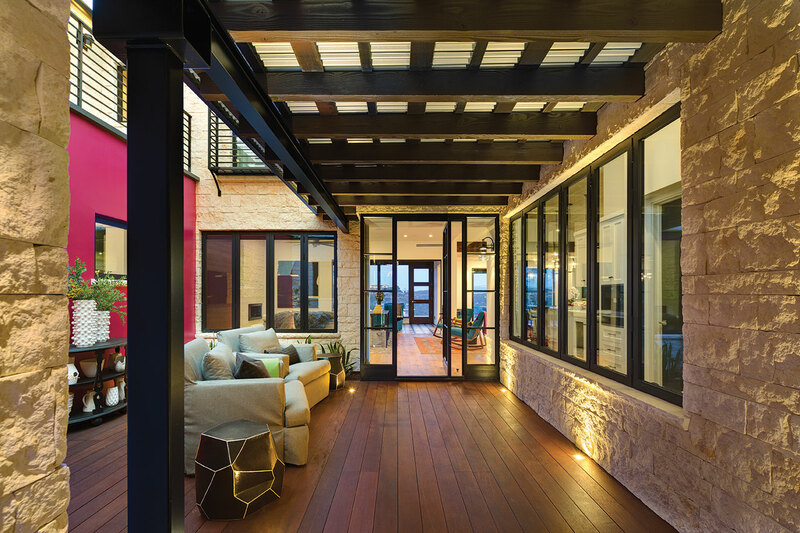 Anita designed a rustic Corten steel entry gate that leads into a trellis-shaded interior courtyard over a walkway covered with the same fire-resistant exotic hardwood flooring used for the exterior decking. 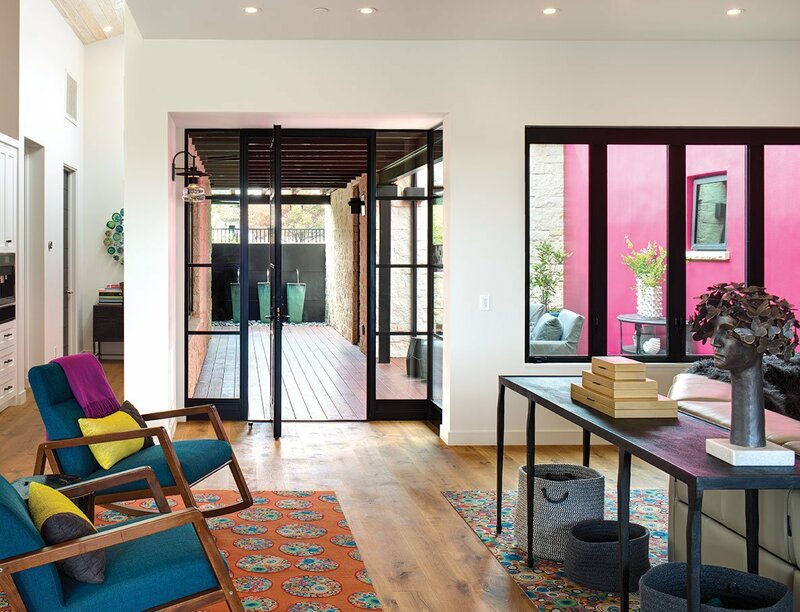 The courtyard adds the whimsical surprise of a single magenta-painted stucco wall, a tribute to Mexican architect Ricardo Legorreta, which also signals the use of Sandy’s preferred vivid colors throughout the home. The home’s entrance connects with the open-plan great room, dining area and kitchen through a covered walkway which passes alongside an interior courtyard. 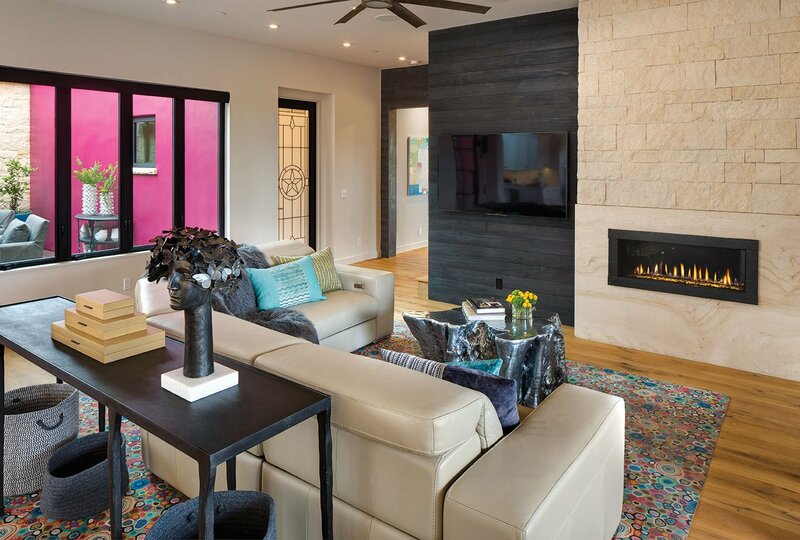 The outdoor living space features casual seating and a magenta-painted stucco wall. A heavy black-framed glass door pivots open from the courtyard into the open-plan great room splashed with lots of brilliant color combinations—a raspberry credenza paired with royal blue-upholstered chairs in the dining room, teal-covered rocking chairs with yellow cushions and a magenta throw between the living room and kitchen and dog-friendly multicolor rugs demarcating living and dining areas—set against a backdrop of white and black. Four turquoise-covered easy chairs fill the adjoining screened-in porch, where Sandy enjoys sitting and experiencing the canyon breezes. Modern rocking chairs upholstered in a teal fabric, colorful area rugs and the magenta wall just outside the great room showcase Sandy’s love of strong colors. Many of the building materials Alton and Sandy purchased in Austin, including the limestone used for the exterior cladding and interior fireplace walls. Whiter than most varieties, the Texas limestone provides a high contrast with the black-framed windows and black structural steel supports, roofing and trellis. The Whites also found the home’s reclaimed European oak flooring in Austin as well as the black surface-charred shou sugi ban wood cladding used to screen off the master bedroom from the public spaces. For the ceilings they chose cypress paneling, lightly washed white or gray in bedrooms upstairs. “Everything outside pays homage to Texas,” Anita explains, while the interior also references their home state. One special request was to incorporate a Texas star “somewhere” within the house. Anita solved this by designing a prominently placed clear leaded-glass door with a star center panel to connect the laundry or mudroom with the great room. Stools surrounding the kitchen island, with their whimsical red metal legs and black-and-white cowhide covers, also nod to Texas. Sandy enjoys cooking while Madison researches and Porter the pup lounges. Because of their site’s space restrictions, designing the back patio overlooking the preserve proved challenging, Sandy says. For her it’s one of her home’s key attractions. “I wasn’t going to give up on it. The most important part of the lot was the view over the preserve,” she explains. Anita found blue Adirondack chairs to circle the patio’s fire pit, a favorite spot to barbecue and entertain small groups of guests. The family’s favorite gathering spot is around the dining room and kitchen, where Sandy enjoys cooking. She wanted a functional, easy-to-clean kitchen with state-of-the art appliances, including an induction cooktop and combination steam/convection oven with good pendulum lighting over the island along with a large walk-in pantry. 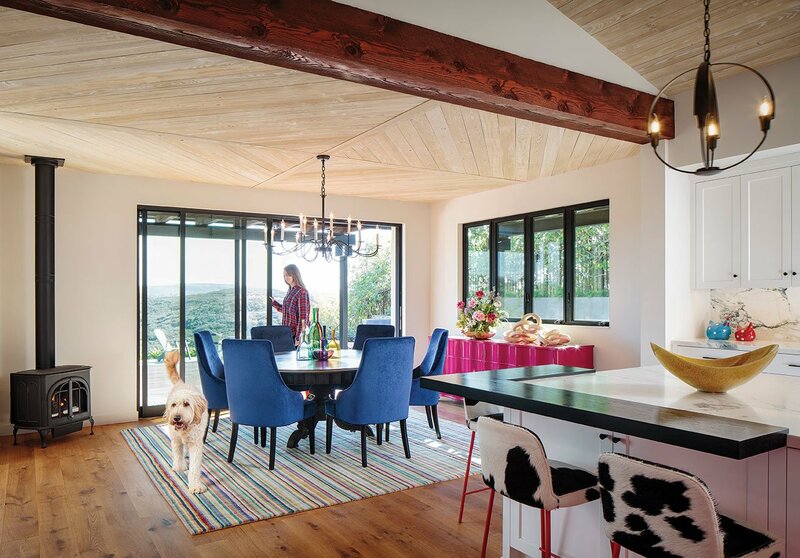 Daughter Madison’s goldendoodle, Porter, heads toward the kitchen through the vibrantly colored dining room overlooking the canyon. Sandy loves marble. As her first material selection she chose the kitchen’s white, gray and black Italian marble, which established her home’s basic color palette. Those colors carried through to the half dozen black-and-white tile floors Anita and Sandy had fun designing for several rooms, including the screened-in porch, mudroom, dressing rooms and bathrooms, each one distinctive. The AT&T Hotel & Conference Center in Austin, one of the Whites’ favorite places to stay, inspired the design for the blue- and magenta-accented master bedroom, which incorporates built-in exotic dyed-wood nightstands and a comfortable adjoining sitting room with sofas. 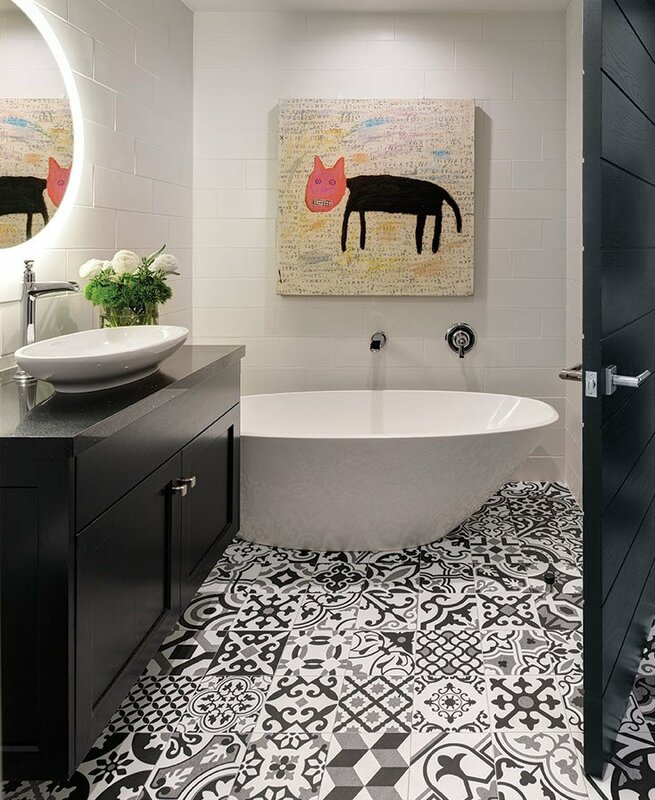 Their white-and-black master bath has a shared central marble-lined shower with separate basin, toilet and walk-in closet on either side for each spouse. Sandy continues to have fun decorating her house and cherishes the quiet and breezes flowing from the canyon. And the empty nest? It’s no more, as their daughter returned home temporarily between college and graduate school.